Get Tough seems to be an ironically appropriate title for the Woggles' newest release. During a recent gig in Pensacola, Florida, lead singer Manfred "the Professor" Jones was left with 15 stitches following an onstage escapade gone wrong. Four songs into the band's set, Jones leapt up to swing from a pole in the ceiling. The pole fell out of the ceiling, sending the singer crashing straight on his back. However, "the Professor" still finished the set, attesting to his fervent belief and passion for the Woggles' music. Later, at the emergency room, his was misdiagnosed with a compression-fracture. 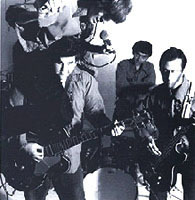 As students at the University of Georgia at Athens, working at the student radio station, the future Woggles noticed that no one was playing the music live that they enjoyed. Thus the Woggles were born, playing their first gig Halloween of 1987. The band's first two albums, Teen Dance Party (1993) and The Zontar Sessions (1994) were released on Estrus Records, a label out of the Seattle area that specializes in garage rock. Over the years, the band has undergone numerous personnel changes, the most recent incarnation consisting of Jones on lead vocals, guitarist George "Montague" Holton, bassist Patrick "Buzz Hagstrom" O'Connor and Dan "Electro" Hall on drums. Manfred talked about the new album and the band's philosophy. Jones' belief in the Woggles' music is evidenced not only by his dogged determination in finishing the Pensacola gig, but in the way that he repeatedly refers to their songs as "our children" and "our babies." The 14-song Get Tough is now available on Telstar Records on both vinyl and CD. QUESTION: What was your approach on the new record? Did you use the same formula that the band used on the first two albums? Manfred: We've never gone in and done a full-length record. All we had done previously, we would do a single, at least three songs. Those were compiled later to full-length records. Teen Dance Party wasn't recorded the way that we would have liked to have done it - we didn't get to give our children as much loving as we would have liked to. In this instance [Get Tough] the band all recorded pretty much playing live. Lots of guitars through lots of different amps, looking for that ultimate sound. To improve on the Kinks is kinda hard!!! I think what we're doing is taking the approach that we had when we were doing the singles, and try to apply that to a full-length record. QUESTION: Your first two albums are a great representation of the Woggles live. A lot of bands can't pull that off! Manfred: Especially the stuff on the Zontar Sessions has that, and the new record has that, too. QUESTION: Who writes the songs for the band? Manfred: It is actually pretty evenly distributed - it is a meeting of the minds! Dan has four. Then there's myself and the guitar player, Zorko. He and I co-wrote most of the other songs. Patrick and I did one song together. Then he, I and Martin did two others. I think everybody has a share in what we are trying to do - to try and show that there's still a lot of genetic material left in those three-chord chromosomes. Manfred: That's actually one of the finer things about it, the songs aren't all sounding the same. I notice with a lot of bands, they have a new batch of songs, like six new songs, and one song is great, the other four sound like weak versions of the one good song. QUESTION: What is the band's philosophy on your style of songs? Manfred: The song's lengths are generally two to three minutes long. Generally, we want to keep it short and have a cool solo that doesn't detract from the rest of the song. These bands that are into "jamming" are like the worst thing imaginable to me. It's the antithesis of real rock and roll. Playing a three-chord song for ten or 15 minutes is just pointless! I mean the song is just not fun anymore. The brevity of it is partially responsible for your wanting to hear it again. Manfred: Great music is just timeless anyway. The really stripped-down basic elements of rock and roll, there's just a timeless attraction to that. No one would walk in and say to Mozart, "man, you are retro". Dan told me this story how a gig in Alabama one guy there way saying, "well, this stuff has pretty much peaked I think, it's just a trend." Dan's response was, "yeah, I guess so - a trend that's been going on for 30 years!" QUESTION: I've seen a lot of bands that put out material that is vastly superior to some of the bands that "make it" and get huge amounts of airplay. What are your expectations? Manfred: Pretty much the radio is set up against you right now. What the record allows us to do is continue. Basically, I'm hoping if things go well, we can do another record and get more shows. Maybe tour with other bands. In 20 years I want to be able to look back and say "yeah, I did everything that I wanted to." I can look back at my records and say, "those are my babies, I love 'em."